Hey Chuck, Can you please tell me your thoughts about this sign. I would like to Share those thoughts with my friends on the following FB Groups. San Antonio Cycling Community, San Antonio Cycling, Alamo City Bicycle Crew, and Bicycle San Antonio. First, in any functional place, this sign is redundant. This is a handful of blocks from the core downtown of San Antonio. It is two blocks from UTSA. Why would there need to be a sign telling people that bikers are welcome and that they can use one of the two lanes in each direction? Where are they supposed to be? This is a signal – one of MANY – that biking and walking infrastructure is a sad afterthought here, if even thought of at all. Second, why this street? I’ve walked all over the past couple of days and never saw another one of these signs. The approach here seems random and, as a result, bikers feel unwelcome just about everywhere in the core city. 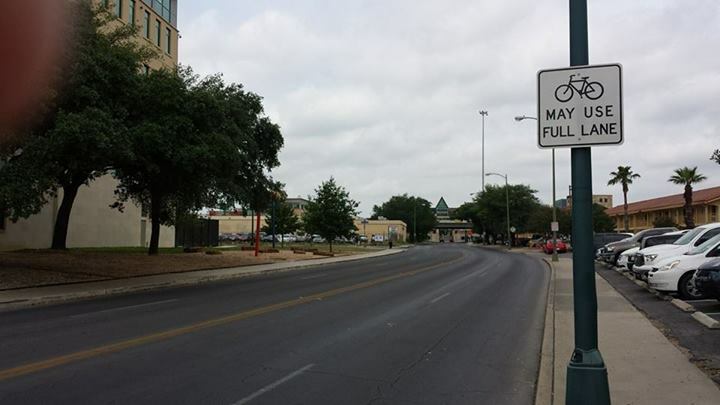 I know bikers are not being anticipated on almost every street in San Antonio – why would they be, the place is practically 100% designed for automobiles – and this sign simply reinforces that. It would be like a sign saying “Women may use the full lane.” Um…yeah, of course they can….who is suggesting they can’t? Third, there’s no traffic. San Antonio is on the verge of accomplishing what places like Detroit, Omaha and Kansas City have accomplished: building their way out of congestion. There are no cars here. No congestion at all. Even during rush hour, these stroads are essentially empty. The prohibition of on-street parking and the randomly-timed traffic signals make it feel even more surreal. I would add to that photo another I took here looking at UTSA. Understand that this is a photo of the entrance to the University of Texas, San Antonio campus. What is the message here? No walking? Are we serious? This is a college campus. Strolling to, from and around campus has been happening since Plato. Now, to be fair, you can walk here if you follow the traffic engineer’s requirements and cross over to the other side of the street where there is a crosswalk. This is done so as to not inconvenience the (non-existence) traffic. To hell with the students. Is Texas educating its automobiles or its young adults? Despite being a college campus, this entire area is designed to facilitate drive by traffic. Every curb radius that I’ve seen in this city is 30 feet or greater, even in the core downtown where there are people trying to walk. A 30-foot radius simply means that cars don’t need to slow down much when taking a corner, a scary encroachment from anyone standing on the corner waiting to cross. The message here is clear: stay in your car. When I saw that no walking sign, my reaction was: Mission Accomplished. San Antonio, you have a lot of great stuff going on. And, more importantly, you have the potential to do some amazing things. The highest returning investments you can make – and the easiest and least costly thing you can do to make San Antonio a great place – is to focus on biking and walking throughout your core neighborhoods. You could move the needle from “despotic” to ‘manageable” fairly easily at very low cost. That would be game changing and would accelerate the kind of private investments you are seeing in and around other areas where walking and biking is more accepted.